Derby girls Jell-O wrestling, $2 Jello shots, DJs spinning live all night, cocktail specials, and huge dance party! Watching powerful women come together to fight like warrior princesses!!! I know. There is literally nothing more amazing. 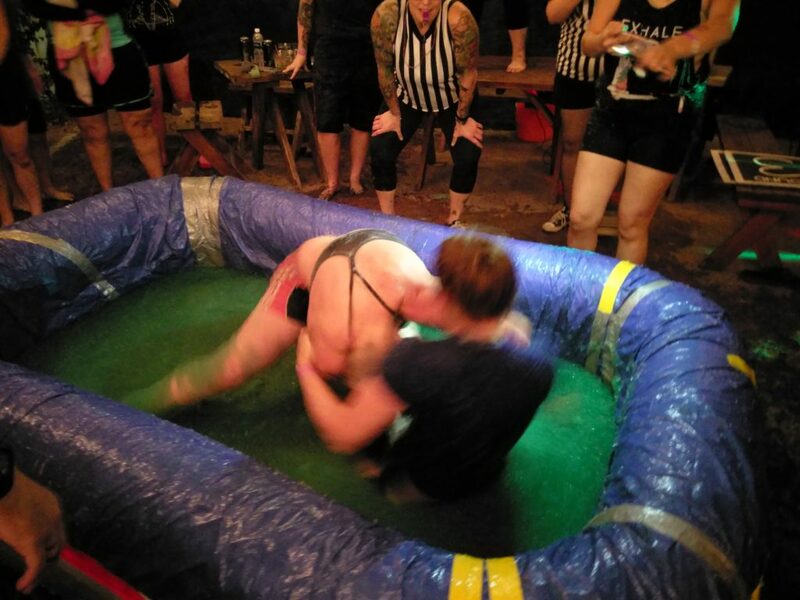 Come watch these wonder women throw down during their Jell-O Wrestling matches at SMASH BASH! We will be there partying like rock stars and aggressive cuddling in the Jello pit afterwards! They had me at “derby girls”. I was definitely interested, but the event was supposed to start at eight o’clock and I had to work until 8:30pm. If I was gonna go, I’d have to head home after work, get changed, and then head back out again. I figured I’d get there really late and the whole thing would require a lot of effort on my part, so I wasn’t completely sold at first. That changed when my friend–who I will only refer to as “The Mighty Moof” (her wrestling name and childhood nickname)–announced that she would be competing in the Jell-O wrestling tournament. I had to see that! I arrived at the venue on West Adams Boulevard shortly before 10pm. They were just about to get started because we live in Los Angeles and we don’t believe in keeping to time here. 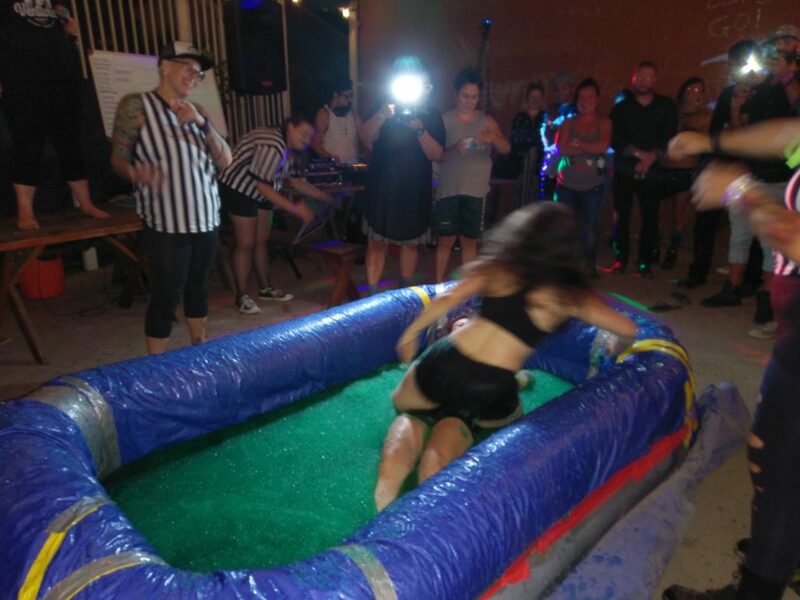 The matches began, and “wrestlers” with names like Caramel Popcorn, The Booty Bomber, and Trainwreck, stepped into the ring (read: inflatable pool that was filled with Jell-O) to show what they were made of. What these wrestlers lacked in skill, they made up for in enthusiasm. The first leg of the tournament went by pretty quickly, but as the competition progressed and the weaker contestants got eliminated, the rounds became a lot more intense. It was difficult to predict who would win. I yelled at the top of my lungs in support of The Mighty Moof. She won her first two fights and made it to the semifinals, but ultimately lost to “Trainwreck” who went on to win the tournament. I was thoroughly entertained through it all. Even though she lost, Moof had a great time. She told me this as she scooped handfuls of jell-O out of her sports bra. She rinsed off with a hose, and then we went out for a late night meal with a new friend in tow. This is…. awesome 0.0. Good idea for a party.